One new addition is the story of the Ariel Aqueduct at Selly Oak, and with thanks to Rev White, we have reproduced it here – along with a suitably wintry slice of canal history. Early in 2009 Birmingham City Council agreed the construction of a new relief road to reduce road traffic along the Bristol Road through the busy centre of Selly Oak and so make possible a regeneration of the area, with improved facilities for pedestrians and cyclists. The new road, 10 metres wide and 1.5 kilometres long, extends from a new roundabout on Harborne Lane to another roundabout, then immediately right under a new railway viaduct and a new canal aqueduct, then right at another roundabout and on just south of the Birmingham University campus to join the Bristol Road near to its junction with Bournbrook Road. Construction began in July 2009 and the road, requiring extensive excavation, was completed and open to traffic in August 2011. The contractors were Birse Civils Ltd, and the work was carried out by them with the co-operation of Network Rail and British Waterways. The road was officially opened on 13 October 2011. The railway viaduct was constructed near the track and installed during a closure of the railway line from 25 to 29 December 2010, using self-propelled modular transporters to propel it into place. To make possible the construction of the canal aqueduct without a lengthy canal stoppage, a temporary diversion alongside the existing canal was constructed (as shown above). 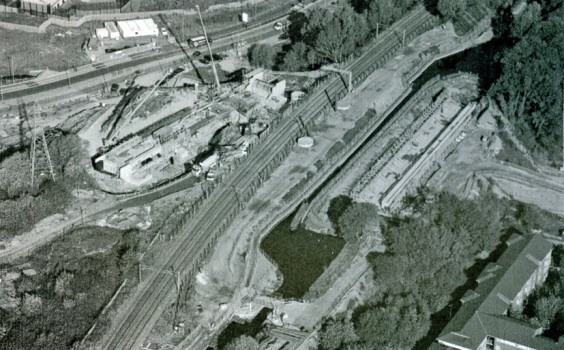 The waterway was only closed for short periods of time to enable the connections between the canal and the diversion and their subsequent removal to take place. The aqueduct, 68 metres long, is constructed of reinforced concrete and weighs about 2,000 tonnes. It is named the “Ariel Aqueduct” after the Ariel Factory which was nearby in Grange Road and which, for over 100 years until its closure in 1963, produced bicycles, motorcycles and cars. The aqueduct was officially opened on 16 February 2011. During the 1800s and the 1900s, up to the end of commercial canal carrying following World War 2, there were many winters when the canal was frozen over for long periods. To enable boats to move when the ice was forming or melting and was not too thick, a boat with a strong iron or iron-clad hull was used to break the ice. Following World War 1 the motor tug Sharpness was often used for this purpose. Previously, specially-built ice-boats were used. They were open boats pulled by a team of up to ten or twelve horses lent by local farmers. 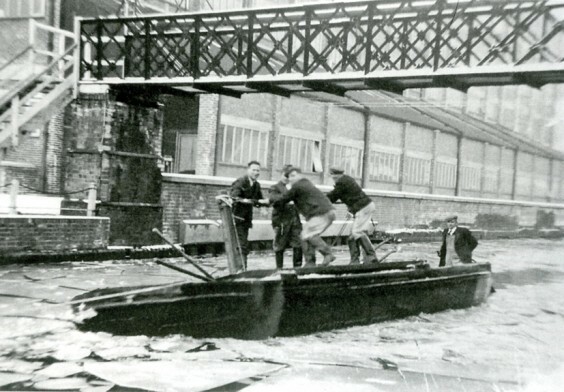 Each had a longitudinal hand-rail to which several warmly-clad canal workers clung as they rocked the boat from side to side as it crushed the ice. It was a spectacular operation, usually attracting a multitude of onlookers. The need for an ice-boat for the Worcester-Birmingham Canal is first mentioned in the Committee minutes of July 1807, soon after the waterway opened to Tardebigge Old Wharf a few months earlier. This could not have been very satisfactory, for a year later, after a fruitless advertisement for an ice-boat in Berrow’s Worcester Journal, an estimate for a new one was obtained from the Birmingham boat-builder James Taylor. His estimate of £140 for the boat, exclusive of iron sheathing, a costly outlay at a time of financial stringency, caused the acquisition to be postponed until the canal was nearly completed. It was in September 1815 that two ice-boats were ordered from Mr Taylor. These, and others which replaced them over the years, were in use most winters as spells of icy weather often occurred. The new edition of Chronicles of the Cut is available at Waterstones in Redditch and Worcester, Foto Factory in Bromsgrove, Tardebigge Church at service times, or from Revd White on 01527 877955, priced £25.